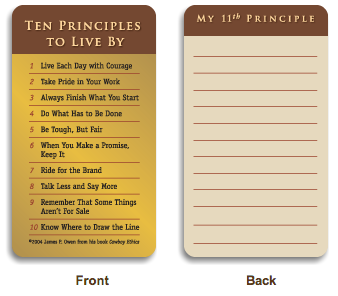 These very popular wallet cards are another great daily reminder of your 11th Principle. People tell us they like to pull these out when they discuss their beliefs or encounter an especially tough ethical choice. Keep several in your wallet to give to friends, family, clients and colleagues. Wallet Cards are 2″x 3-1/2″ (standard business card size), full color on heavy glossy paper. These cards are available in quantities of 25 cards for $10, plus $5 for handling and shipping via standard USPS. To order simply click “ADD TO CART” and input the number of sets you would like. Larger orders are available at a discount. These cards can also be customized for your organization or company. For more information, or if you are ordering from outside the USA, please contact the distribution center at info@alvarezgroup.net or call (323) 876-4808 or fax (323) 876-4545. Additional shipping fees apply to international orders.